Sunwoo is a strategist and entrepreneur with 20 years of experience creating and operating finance and technology businesses. Presently Founder & CEO of SIXUP, a venture-backed FinTech/EdTech company, Sunwoo leads the development of a new online education finance and wrap-around support platform for high-achieving, low-income students. 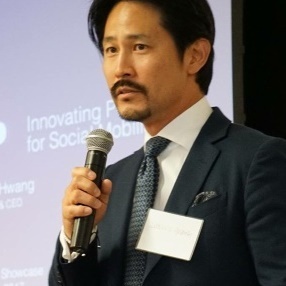 As Managing Director of Proof Ventures, Sunwoo specialized in cross-border investment and market development of startups between the U.S.-South Korea corridor. Prior to Proof, Sunwoo ran a consumer technology incubator focused on innovating new sports marketing platforms powered by user-generated digital media with such partners as Adobe, HP and Beats by Dr. Dre. Sunwoo started his technology career in FinTech and enterprise software. Sunwoo was early-stage cofounder of Northstar Systems, a SaaS wealth management platform later acquired by SEI Investments (NASDAQ: SEIC). Prior to Northstar, Sunwoo served as Entrepreneur-in-Residence at 12 Entrepreneuring, a $130 million incubator backed by Benchmark Capital and Goldman Sachs. Sunwoo was also an operating executive at GlobalCommerce, a B2B e-commerce company backed by G.E. Capital, where he led corporate strategy initiatives and formed strategic alliances with FinTech leaders like IdenTrust and TSYS. Sunwoo started his career with management consultancy, A.T. Kearney, advising such clients as Samsung Electronics and Electronic Data Systems on strategy and operational initiatives. A graduate of Northwestern University, Sunwoo is an avid snowboarder, wannabe celebrity chef and former U.S. National Judo Champion.